A lot of different types of insects like the warmth and relative dryness they can find in a garage, and they will seek out ways to get into your space and out of the elements. Fortunately, there are ways to keep crickets and other types of insects out of your garage and get them out if they’ve already gotten inside. By focusing on the overall structure and the changes you can make to it, you’ll reduce insect problems. Ensure that your garage door is not misaligned. An improperly aligned garage door may still move up and down properly, but it’s not going to give you the tight seal you need in order to keep all the bugs on the outside of your space. Even if your door looks fine and you aren’t having problems with it, having it checked and realigned may make a big difference in how many crickets and other insects make their way into the garage. Don’t leave your garage door open longer than it needs to be when you’re coming in and out, or working on something. 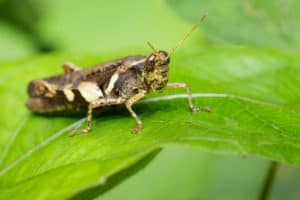 By giving crickets and other bugs easy access for a long period of time, you’re just inviting them to come right inside and take up residence. Naturally, you have to open your garage door to get in and out, and it may be necessary to leave it open sometimes, depending on the type of work you’re doing. At all other times, though, closing your garage door will help protect your garage from insect invasion. Focus on any holes or cracks in your garage’s structure that you might have missed, and be sure that you plug those gaps thoroughly. Expandable foam, mortar, and plenty of other options work very well for filling in small cracks and holes. For larger concerns, it’s much better to have a professional assess the damage and make sure your garage is being sealed up properly. Because insects are so tiny they can get in through cracks and holes that might seem insignificant to you. Thoroughly ensuring that everything is sealed up is well worth the time. Make sure you don’t have any windows open. If you opened a window for fresh air, even a little bit, bugs can make their way inside. Good screens help, but there are still ways to get around those screens, depending on the size of the insect. Be sure to securely close and latch all windows each day when you come in from the garage, and check them to make sure others in your household haven’t opened them, as well. Then you’ll have a much better chance of seeing a reduction in the cricket and insect population in your garage. Declutter – bugs love clutter. They can find all kinds of places to burrow into it, and they can also find a lot of great food sources, too. If you want your garage to be free of insects like crickets, you’ll need to reduce or eliminate as much clutter as possible. Clear out that ground cover – what’s leading up to your garage can be a haven for crickets and other insects. You don’t want to give the bugs that may be near your house any reason to come into your garage, and if there are plants right up to the sides of the structure you could be inviting the insects inside without meaning to. To make sure you’re getting everything you need when it comes to keeping crickets out of your garage, contact Action Garage Door today. Contact us to connect with experienced technicians that can address any of your garage door issues. With the help of Action Garage Door, being serenaded by crickets in your garage in the evening will soon be a thing of the past.